I assume that all of us, in our deepest moments of contemplation, wonder just who we are. Of course, we have our given name, our gender, our ideals, our likes and dislikes, which create and maintain our illusion of self, as Buddha pointed out in his 2nd Noble Truth. How tenacious we cleave to those things determines the strength of the illusion of self (ego). However, as we surrender our grip on these tangibles, who are we then? Emptiness becomes a deepening gut reality, but we are still left with the question. Indeed, emptiness is the mother of the question: Why? Who? What? Where? So who am I? I am my ecosystem! The recent Science New’s feature, The vast virome, is a real eye opener, even to those who feel a part of the whole (see excerpts below). This puts a solid tangible face to that intuition. The question is, can you love the eco-system that you are? That is not the same as loving yourself. Indeed, the more you love the eco-system ‘you’ are, the less self there is left over to love. Therefore, it is easy to see why loving the eco-system we are could be difficult. I think this is where Buddha’s 3rd Noble Truth comes into play. The problem with the 3rd Noble Truth lies in its ideal of ‘conquering self’. Just how does one do that? The illusion of self, we are told in Buddha’s 2nd Noble Truth, is a product of our attachments in life. The Second Noble Truth is the cause of suffering. The cause of suffering is lust. The surrounding world affects sensation and begets a craving thirst that clamors for immediate satisfaction. The illusion of self originates and manifests itself in a cleaving to things. The desire to live for the enjoyment of self entangles us in a net of sorrows. Pleasures are the bait and the result is pain. A common assumption in Buddhism is that once we have developed a genuine understanding of the causes of suffering, such as craving (tanha) and ignorance (avijja), then we can completely eradicate these causes and thus be free from suffering. Sure, it sounds great, as does Christian views of Heaven. Buddh-ism may even be a little closer to the truth, at least to the cause of suffering. It is in ‘eradicating suffering’ where Buddhist believers may take it too far. Blowing away the fantasy of a Nirvana or a Heaven doesn’t mean we need throw up our hands and jump off the cliff in despair. I find it most helpful to appreciate the underlying biology acting upon my perceptions. The colors I see, the flavors I taste, are born of biology. They are not realities in their own right. Increased awareness of deeper and broader ways to see life has a liberating, detaching effect upon me. We can’t just “eradicate causes”, “conquer self”, and leave a gaping hole — Nature abhors a vacuum. We biologically need to feel our being as something, we need something on which to grasp. Grasping to our mother as infants served that purpose. As adults, we end up chasing all sorts of things upon which to grab hold. This is where I loving the eco-system you are comes in handy. Alas, loving your eco-system is not as easy as it may sound. The delusion of self takes up all the oxygen. You can’t just drop the illusion of self and replace it with the idea of the eco-system. It must needs feel real — just as real as the self does. It is a catch 22. You can’t rid yourself of self; that is like committing self-suicide. On the other hand, you can’t genuinely perceive yourself as an eco-system without the ego dropping away. I find letting go of self to be a gradual process. Life time gradually weans us of the things to which we grasp onto throughout life. This slowly make space for a more inclusive sense of self — in this case, an eco-system. The beauty of this research is that it points out who we actually are. It is not me; it is ‘us’. The most abundant inhabitants of what many researchers are calling “the human ecosystem” are the viruses. So Pérez-Brocal reasoned they were worth a closer look. Viruses are deceptively simple organisms consisting of genetic material packed in a protein shell. They are tiny and can’t replicate on their own, relying on human or other cells to reproduce. And yet, scientists estimate that 10 quintillion virus particles populate the planet. That’s a one followed by 31 zeros. They outnumber bacteria 10-to-1 in most ecosystems. And they’re ubiquitous in and on humans. Pérez-Brocal and others are learning that viruses, once seen only as foreign invaders that make people sick, are an integral part of human biology. Some cause major diseases, including influenza, AIDS and some cancers. Others, conversely, may promote health. 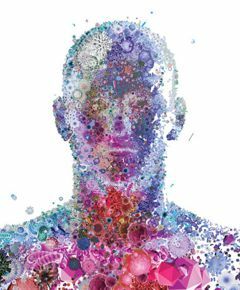 Some may even help us gauge how well the human immune system works. The study of people’s resident viruses, known collectively as the human virome, is “a whole new frontier in the understanding of humans,” and could become important for the future of medicine, says Forest Rohwer, an envAs scientists take a census of the virome, they’ve begun to reveal these kinds of unexpected partnerships, but the work lags far behind that of the rest of the microbiome. As scientists take a census of the virome, they’ve begun to reveal these kinds of unexpected partnerships, but the work lags far behind that of the rest of the microbiome. Not that scientists haven’t been interested in viruses. Until recently there was just no good way to identify them, an important first step toward understanding the biology of health and disease. As a consequence, virome research is in its infancy. The human ecosystem Most identified DNA sequences floating in our blood plasma belong to viruses. Some unknown sequences may also be viral. To figure out which viruses are friends, foes or neutral passengers on the human body, scientists first need to identify them. Researchers still aren’t very good at recognizing new viruses, says Brian Jones, a molecular biologist at the University of Brighton in England. Hence the large pool of unknown samples in Pérez-Brocal’s and other researchers’ virome studies. But even if scientists improve their identification skills, it may take a long time to figure out what the viruses are doing in the body. Based on what researchers have learned so far about the virome, Jones is convinced that viruses and other microbes “should be viewed as a part of us rather than something that lives in or on us.” They are part of the puzzle, the intricate ecosystem composed of human and microbial cells, all pushing and pulling at one another and subject to local conditions, such as diet and environment. If he’s right, then knowing our viruses might help us know ourselves.